I’ve been experimenting a lot more with my cooking and baking since we started this the awesomeness that is DinnerCakes. Most of these forays in the culinary jungle have been met with limited success. My climbing cake was a dismal failure and my roasted stuffed turnips probably won’t knock any one’s socks off. I recently attempted to craft a red velvet cake for my six inch pans and once again the harsh gods of baking slighted me. Sorry Carly, guess you’ll have to settle on store bought cupcakes for your birthday. But hey, that’s life, right? You learn more through failure than victory. Let’s move on to a success story. There are some really great non-profits in the DC Metro area and I’ve had the opportunity so meet some really great people through them. One of the groups I’ve been working with for a few years is the Capital Hill Community Foundation. They’ve been working to renovate elementary school libraries in the Capital South area of DC. I gotta say, they’ve been doing some amazing work. I’ve been coordinating a few volunteer efforts with them recently and this last Sunday we had a really productive day at Ludlow-Taylor Elementary. It’s sometimes hard to get people to sign up for something like a Sunday morning project. I totally understand this. I love sleep. Sleep and I are tight, and on Sunday we try to catch up on all the time we’ve lost over the week. But alas, duty calls sometimes. I try to make sure the projects I organize are enjoyable for everyone and one of the ways I do this is food. People love free food. It’s insane. I mean, anyone can buy muffins at the local grocery store; but if you bring them for people, you’re guaranteed to hook a few. I got up (way too) early Sunday morning to once again attempt another culinary adventure. There was a lot riding on this one. People need their food. Perusing my ever-growing list of to-do’s I came across a tasty looking dish from the folk’s at Baker’s Banter. This blog will make you want to be a baker, people. 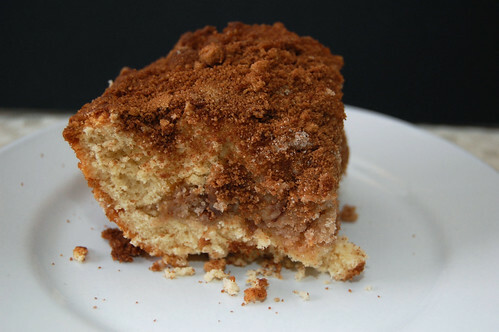 One of their more recent posts was for a Cinnamon Streusel Coffeecake (side note: why must something so delicious be tainted with the label “coffee?”). It. Looked. Awesome. I felt the need to make my own modifications, of course (hey, that’s how we roll here at DinnerCakes). It was a big hit. Next time you need some quick and easy (and cheap) to impress, give this baby a shot to save the day. Interested in service in the DC Metro area? Contact us for more information on how to plug in to the community. Update: My friend Laurian tried this recipe with powdered buttermilk with no ill effect. In addition, she recommends adding some water to the topping for a more crunchy effect. Thanks, Laurian! Preheat the oven to 350°F. 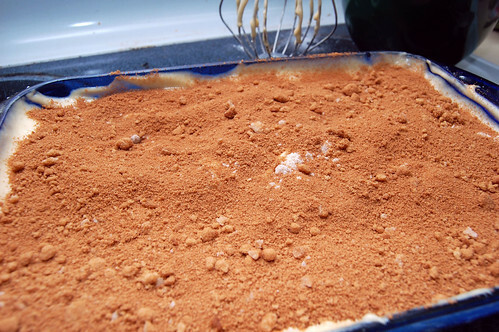 Grease a 9″x13″ baking pan. Mix the filling together in a bowl and set aside. 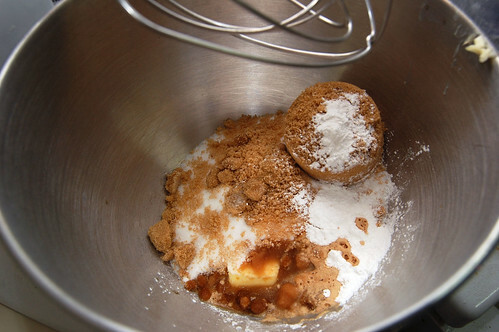 Mix together the topping in another bowl until crumbs form. Set aside. In a large bowl with a stand or hand mixer, beat together butter, salt sugars, baking powder and vanilla until combined and smooth. Add the eggs one at a time, beating in between until well combined. Be sure to scrape the sides. Combine the milks together in a separate container such as a liquid measuring cup. Alternate adding the flour and milk to the butter mixture; three times adding the flour, two times adding the milk (flour, milk, flour, milk, flour). Be sure to scrape down the sides to ensure it’s well combined. Pour half the mixture into your baking pan (since i don’t bother weighing, i tend to put a little more in this half. better on the bottom than the top). Sprinkle the filling evenly on top. Give it a light shake to make sure it’s even and reaching all the corners. Spread the remaining batter on top; evenly. If you have a pastry scraper, I recommend using this to help evenly spread the batter, but a spatula will work as well. Sprinkle the topping evenly over the pan. A bit more light shaking will help. Bake until golden brown at the edges and passes the toothpick test; approximately 50-60 minutes. Remove from the oven and let sit for 20 minutes. Service straight from the pan and enjoy. This looks sinful. I’m going to have to try immediately.